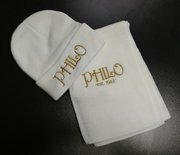 Perfect for the cold weather - our acrylic skullies and scarves are beautifully embroidered and made to keep you warm. Of course, the embroidered year will be "1943". We apologize for the mistake in the picture.